This is the issue on which the episode “Holiday Knights” is based. I’m not going to perform my usual summary here, as the stories are so well know from the animated episode. Instead I just wanted to comment on a few things. 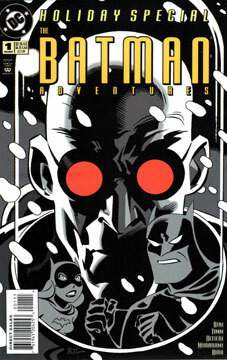 Most of those involved in this issue were involved in the animated series. It must have been tremendous fun to put together! There’s a genuine enthusiasm in the writing and the art throughout the book. Perhaps it’s because the show itself was a well-established hit by night, and the creators had been given some creative freedom. Three of the four stories were adapted for the episode. As Paul Dini wrote the comic and the episode, very little was changed. In fact, reading the comic feels more like looking at a storyboard for the show. It’s also fun to see the characters in the BTAS designs, when I’m so used to seeing their TNBA counterparts animated. The one story cut from the episode was a Mr. Freeze tale. In terms of a dramatic story, this one is probably the weakest of the four, and I can understand why it was cut. However, it is a nice character moment, for Bats and Freeze. Six great artists! We get some great Bruce Timm art, plus samplings from other show crewmembers. Of note is Murakami’s art for “White Christmas.” I can’t say I know his style under normal conditions, but this sure looked like a tribute to Mignolia. Which is fitting, of course, as Mignolia helped design Freeze’s suit. Yes! Bullock and Montoya as Santa and elf. Harley and Ivy in “around the house” wear (different from those seen in the animated episode), Joker in a white tux (a nice touch not seen in the animated episode), and of course New Year’s Batman and Gordon.